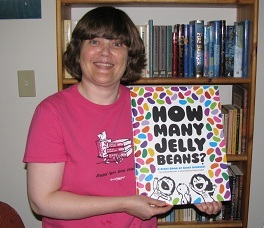 ﻿ Sonderbooks Review of How Many Jelly Beans? The story is simple. Emma and Aiden (with thoughts expressed by their dog) are asked how many jelly beans they'd like. Emma starts with ten, and we see a close-up of her hand with ten jelly beans. Emma's response seems quite realistic for a kid. "He can have twenty? I'll have TWENTY-FIVE!" The responses escalate: fifty, seventy-five, one hundred. All of those amounts are shown on a tabletop. Since the tabletop in the pictures is the same every time, just with greater or fewer jelly beans distributed across them, this doesn't really show the quantities viscerally. However, that will change by book's end. I like it when they get to details. Emma tells Aiden he can't eat five hundred jelly beans, and he tells her that in a year he could eat a thousand jelly beans. On the next big double-page spread, we see jelly beans distributed on pages of a calendar. Emma says, "Wait a second. That's only two or three jelly beans a day." They go on. Ten thousand jelly beans. A hundred thousand jelly beans. Now the children are shown as quite small, with a hundred thousand tiny jelly beans spread out around them. I like it when Aiden tells us how he'd distribute the flavors if he had a hundred thousand jelly beans. Only one would be lemon. 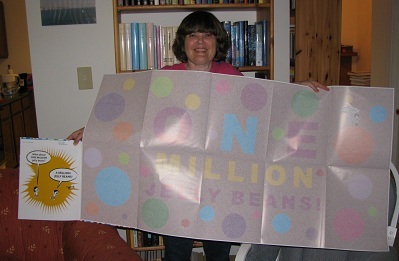 But the truly marvelous part of this book, the tour de force, is the foldout section showing ONE MILLION jelly beans. In fact, when you first pull it out, the kids are saying, "Wow! A million jelly beans is a lot!" But then they say, "This is only HALF a million jelly beans! Look up there!" When you unfold the page further, then, at last, you see a million tiny jelly beans. Now, I'll be the first to admit that this book is not going to hold up well to library usage. It was not easy even for me to hold up the book with the page open without tearing the pages. And if you tear the page along the folds, it's not going to be at all easy to mend.